Apple will launch iPhone 6, its next flagship phone, soon. According to latest reports, Apple will release two versions of the device: 4.7-inch and 5.7-inch. Analysts think the 5.7-inch will be the “motherload of all upgrade cycles.” That is Apple will target Android big screen fans and compete better in the smartphone arena. Analysts believe Apple can boost up production and sales every year if it will start diversifying. According to Brian Marshall, analyst under ISI Group, iPhone users go through “large-screen envy” with other Android devices. Marshall predicts the existing iPhone series has about 260 million users. This sums up the total of iPhone sales for the past seven quarters. The analyst also predicts that over 50 percent of iPhone sales at the moment will become upgrades. This means Apple can ensure that whoever buys it existing mobile device today will likely upgrade to what they will offer next. It should be good news for the tech giant. The analyst believes Apple can cater better to the smartphone market by releasing two new models. Also, the forecast indicated Apple’s earnings per share will reach up to $3.00. The tech giant has not released any official statements of what people can expect from iPhone 6. In addition to showing off a more iPad mini-like design, complete with a beautiful bezel-less display, this model has no home button whatsoever. Kind of crazy considering all the resources Apple put into Touch ID. But it doesn’t look half bad, and with the absence of any home button, Apple would be able toincrease the screen size without making the phone itself bigger. This is just a concept, and probably too good to ever exist, but that doesn’t mean we still can’t fawn over it. 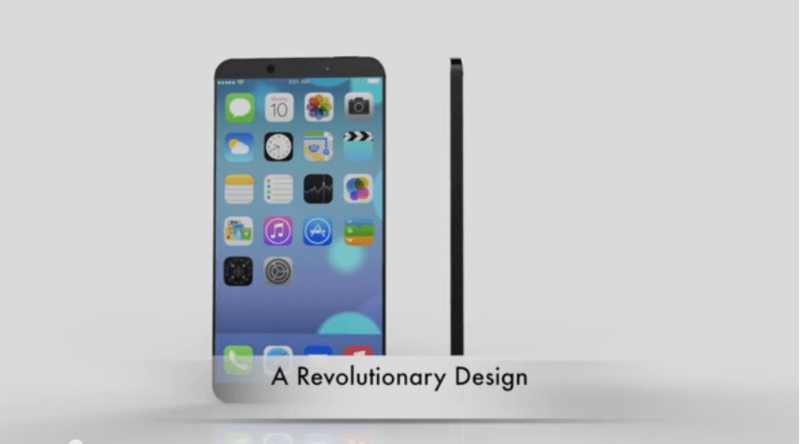 Hajek worked out a similar concept early last year, showing off a taller, wider screen without turning the iPhone into a phablet. It seems like something Apple would do, especially considering how concerned the company’s executives have been with usability. While it’s unlikely Apple will ditch the home button anytime soon, seeing as Touch ID is a staple feature, the iPhone would sure look good without it. Rumor has it that Apple’s upcoming iPhone 6 will feature a larger screen made of sapphire glass. Some wonder whether or not this is a practical possibility, but according to new reports, Apple just ordered enough sapphire crystal to make hundreds of millions of iPhones. The rumor that the iPhone 6’s screen will feature sapphire glass came when CNBC reported that Apple made a $578 million deal with GT Advanced Technologies, which specializes in producing sapphire substrate. According to various analysts, however, an iPhone, or any other large smartphone enhanced with a sapphire glass screen, would be too expensive for anyone to be interested. 9to5Mac, on the other hand, reports that Apple just acquired enough sapphire crystal furnaces to make between 100 million and 200 million 5-inch iPhone screens. The blog cites “new documents” and information from Matt Margolis, an analyst, as their source. One of the documents obtained by the blog says that sapphire glass can be made more affordable by “lowering manufacturing and fabrications costs of sapphire,” which GT Advanced Technologies is doing. Others still say the feature is not likely. They suggest that sapphire glass will probably be used for the iPhone 6’s home button and camera or Apple’s iWatch or iPods instead. According to a recent report from KDB Daewoo Securities Research, Apple will releases its newest smartphones in the second or third quarter of this year. Other rumors suggest that Apple will debut the iPhone 6 at the Worldwide Developer’s Conference in June. Based on the company’s release patterns, Apple will likely release new phones to the public in the fall, one year after the release of its newest smartphones, the iPhone 5s and iPhone 5c.